Every time you make a left turn there is a certain level of risk involved. The reason for this is simple. We drive on the right side of the road in the United States. So a left turn usually involves cross over one or more lanes of traffic going the opposite direction. Moreover, the vehicles in the opposite lane are often traveling at high speed. If you make a left turn in front of another car going 50 mph it can result in a very serious accident. In most situations, when you make a left turn the traffic in the opposite lane clearly has the right of way. When making a left turn across traffic, it is your responsibility to make sure the coast is clear and that you can complete the turn without getting struck by oncoming vehicles. If you make a left turn and someone in the opposite lane hits you, the accident will always be your fault. There are few exceptions to this rule. Turning left is one of the leading causes of car accidents according to the U.S. National Highway Traffic Safety Association (NHTSA). In fact, 22% of all car accidents involve a left turning vehicle and 53 % of all cross-path accidents are the result of left turns. The NHTSA estimates that almost half of the 6 million auto accidents that occur each year are "intersection-related" and that the majority of these are left turns. The risk of left turns is such that since 2004 UPS has used a route-optimization strategy for its delivery drivers that seeks to eliminate left turns entirely. Below is a summary of various reported settlements and verdicts in auto accident cases involving left-hand turns. These cases illustrate the range of serious physical injuries that can result from left turn accidents. 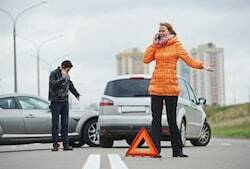 Basargin v. State Farm (Alaska 2018) $85,400: Plaintiff, 38-year old female, was a passenger in her friend's car when it struck another vehicle that made a left hand turn directly in front of them. As a result of the accident, plaintiff fractured her arm and her shoulder and had to undergo reduction and fixation surgery. The jury awarded $55,000 for pain and suffering and $30,400 for past medical expenses. Jenkins v. Downing (New York 2017) $425,000: Plaintiff was riding a motorcycle through an intersection. The defendant made a left turn in front of the plaintiff and was almost completely through the intersection when the plaintiff stuck her on the rear side. Plaintiff was not wearing glasses as required by his license, but he disputed that this contributed to the accident in any way. As a result of the accident, the plaintiff fractures his femur and had to undergo orthopedic surgery to repair it. Although the plaintiff was back to work in 6 months he claimed that he continued to suffer pain and lack of movement in his knee. Plaintiff's orthopedic expert also testified that he will suffer permanent discomfort and will likely require knee replacement in 10 years. Plaintiff rejected pre-trial settlement offers of $100,000 and later $300,000. The jury in Suffolk County awarded $425,000 in damages. Bienemy v. United States (Louisiana 2017) $311,900: A U.S. postal truck made a bad left turn at a highway intersection and caused a collision with plaintiff. Plaintiff's injuries included multiple disc herniations in the cervical spine area (C4, C5, C6) with pinched nerve roots; bulged discs in the lumbar region and disc herniations in the thoracic spine. Defendant admitted liability but disputed the extent and validity of plaintiff's various injuries. Pearson v. Sarmiento (Michigan 2017) $458,000: Plaintiff was a postal truck driver. Defendant made a left turn through an intersection despite a red light arrow and struck plaintiff in his postal truck as he entered the intersection on a green light. Plaintiff alleged injuries including T11-T12 and L1 fractures, bulging lower discs, fractured ribs and a traumatic brain injury from hypoxia. Defendant denied liability and disputed the plaintiff's injuries, particularly the neurologic injuries. Defendant claimed that plaintiff was contributorily negligent. The jury determined that the defendant was 90% at fault and awarded $509,000 which was reduced to $458,100 based on the plaintiff 10% share of negligence. Ball v. First Floridian Auto and Home Ins. (Florida 2017) $650,000: An uninsured driver made a negligent left turn in front of the plaintiff and struck plaintiff's car on the left front bumper. The collision caused the plaintiff's vehicle to spin around and collide into a second car. The 65-year old plaintiff claimed that the accident caused him to suffer a posterior vitreous detachment which resulted in a torn retina in his right eye requiring surgery to repair. The injury allegedly left plaintiff with permanently impaired vision in the right eye. Defendant's expert disputed that the eye condition had anything to do with the auto accident. The jury disagreed and awarded the plaintiff $650,000 in damages. Marinaccio v. Colton (Connecticut 2017) $115,000: Defendant attempted to make a left turn in front of the plaintiff on her motorcycle and caused an accident. The plaintiff alleged that the accident caused her to suffer a fractured vertebra with radicular pain. Plaintiff also fractured her arm. Defendant admitted liability but disputed damages. The jury rules in favor of the plaintiff and awarded $20,000 for lost wages and medical expenses plus $95,000 for pain and suffering. Plaintiff Pedestrian v. Defendant Transit Bus (Massachusetts 2017) $1 million: The defendant was making a left turn in a transit bus at a busy intersection in downtown Boston. The plaintiff was a pedestrian walking through a crosswalk with the right of way. The bus driver's view was obstructed and he did not see plaintiff in the crosswalk. The bus struck and crushed the plaintiff and she died from her injuries. The case settled for $1 million. Dickson v. UZHCA Langer Transport Co. (Pennsylvania 2017) $675,000: Defendant was driving a tractor which was hauling a fuel tanker when he made a left turn from a stop sign and caused a collision with the plaintiff who was driving in the opposite lane. The 22-year old plaintiff suffered head trauma resulting in permanent mental disabilities. The defendant claimed that the plaintiff should have seen the truck making the turn and been able to stop in time to avoid the collision. The case settled just prior to trial. The personal injury attorneys at Miller & Zois have handled hundreds of auto accident cases. If you or someone you know has been injured by the negligence of another driver call us today at 800-553-8082 or get a free consultation online.